In the Full Expensing provision of the TCJA the new tax law did away with depreciation schedules that specified how many years companies were required to take to write off capital expenses like new plants & equipment & replaced these schedules for the next five years with immediate deductions for the entire expense. Some building expenses under the old law were written off over a period of decades, a few percent per year, where inflation could take a mighty toll over the life of an investment, meaning that the new tax law provides a tremendous cash flow advantage that businesses have called for & need in order to increase productivity enhancing investments. Under BO's administration labor productivity lagged as new investment barely managed to offset depreciation. In the biggest pro-growth provision of the new tax law the TCJA allows the untaxed repatriation of profits earned outside the U.S. - because it was designed to incentivize companies to invest, hire, & produce more in the U.S. The Repatriation provision is the result of the new tax law changing the American tax system from a world-wide tax system where the U.S. assessed taxes regardless of where the income was derived to a territorial tax system that taxes only income earned within a country's borders. Under the world-wide tax system companies held profits overseas to avoid the tentacles of the old 35% corporate income tax – in essence, after a one time tax on old earnings whether or not the money is repatriated, companies can bring home foreign profits untaxed by the U.S. thereby freeing cash flows on money previously thought of as trapped in foreign subsidiaries to avoid the U.S. tax. 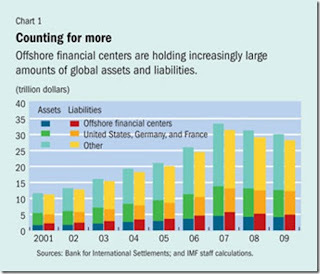 As of January 2018 there was an estimated $2.7 to $3.0 trillion of income (about half held in cash or other liquid assets – source Morgan Stanley) of 108 publicly traded companies that was parked overseas. See graphic below from the WSJ that shows the increase in repatriations in the first two quarters of 2018 after the new tax law was passed – $294.9 billion in the first quarter, $183.7 billion in the second quarter, & $92.7 billion in the 3rd quarter (not shown on graphic) – or over $571 billion brought back to America from overseas in the first nine months of 2018 compared to only $128 billion in the first nine months of 2017. But as students of the FairTax know there is $30 trillion parked outside the U.S. that will have a strong propensity to be drawn to the U.S. for the exact opposite reason that it did under the former world wide tax system – the disobliging incentives caused by the former corporate income tax system which are substantially reduced under the new tax law. 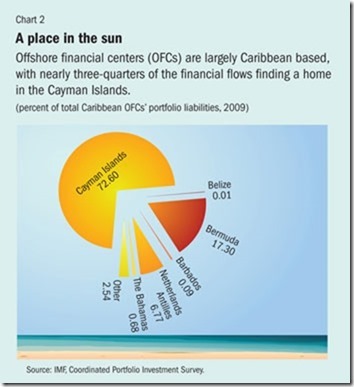 The $30 trillion consists of money held in off shore financial centers, cross border financial centers comprised of many currencies whose estimated value in 2009 was $30 trillion – see graphics below. The incentive the new tax law provides is real stimulus to our economy, whether allowing untaxed repatriated corporate income to return to our country or attracting capital from other countries held in off shore financial centers, in that the money supply & interest rates will be affected by market forces that will work to let our economy naturally grow thereby providing a much better investment opportunity than places like the Cayman Islands & other off shore financial centers. 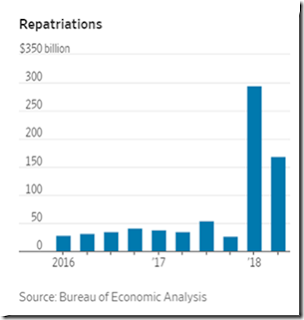 Although real U.S. capital expenditures were up an impressive $180 billion as of the third quarter of 2018 from the fourth quarter of 2017 it is important to not be impatient but rather wait about three years to see the results from the repatriated earnings clause of the new tax law. But what we can say now is that it is only common sense that more business investment (& less government regulations) would increase economic growth through productivity increases thereby increasing the economy's capacity to produce goods & services that raise Americans' standard of living. Entrepreneurs & investors have expressed keen interest in investing in the low-income areas specified, by each state, in the new tax law - Opportunity Zones. The intent is to drive long term capital expenditures & the resultant job creation into some of America's most distressed communities. Nearly 35 million Americans live in these opportunity zones – they have higher poverty & unemployment rates than the rest of the country. In 2008 the Census Bureau found that 54 million people were living under 125% of the federal poverty level, & the number of "deep poverty" – defined as people whose incomes are less than 50% of the federal poverty level – was 17 million people. Investors in such opportunity zone communities are offered tax advantages such as 1) being able to roll capital gains from an unrelated investment into a designated opportunity zone & defer those capital gains taxes until 2026 & then having those capital gains taxes further reduced if the opportunity zone investments are held long enough, & 2) avoiding taxes all together if the investments are held for @ least 10 years. Investments in opportunity zones are especially attractive to real estate developers with unrealized capital gains. Treasury has designated nearly 9,000 census tracts as opportunity zones spread across urban & rural areas & most of Puerto Rico. Developers have been planning projects that would qualify for them to invest under the Opportunity Zones clause of the new tax law. Examples – a Marriott hotel in Arizona, affordable housing in Los Angeles, & a 22-story office building & hotel in NYC's Washington Heights neighborhood. The obvious benefit of the Opportunity Zone program is that it has the potential to revitalize economically distressed communities using private investments rather than taxpayer funds – a financial goal worthy of pursuit not only in this one specific worthwhile program but in beginning a mindset change away from one of government dependence to one favoring free market capitalism. In summary, the last three posts have presented a series of key issues on the economy – the first showed the importance of continued economic growth for America, the second showed the headwinds facing economic growth in America, & Parts A & B of this post taken together showed how several features of the Tax Cuts & Jobs Act of 2017 along with several of the Trump administration's policies & practices provide a counterbalance to the referenced headwinds & give us a good chance for enhanced prosperity in the years to come. President Trump's first budget from June 2017 did not call for 3% real economic growth until 2020 after estimates of 2.5% in 2018 & 2.8% in 2019. So far so good & then some.